Jacksonville is the largest city in the U.S. state of Florida by population and the largest city by area in the contiguous United States. It is the county seat of Duval County, with which the city government consolidated in 1968. Consolidation gave Jacksonville its great size and placed most of its metropolitan population within the city limits; with an estimated population in 2012 of 836,507, it is the most populous city proper in Florida and the Southeast, and the twelfth most populous in the United States. 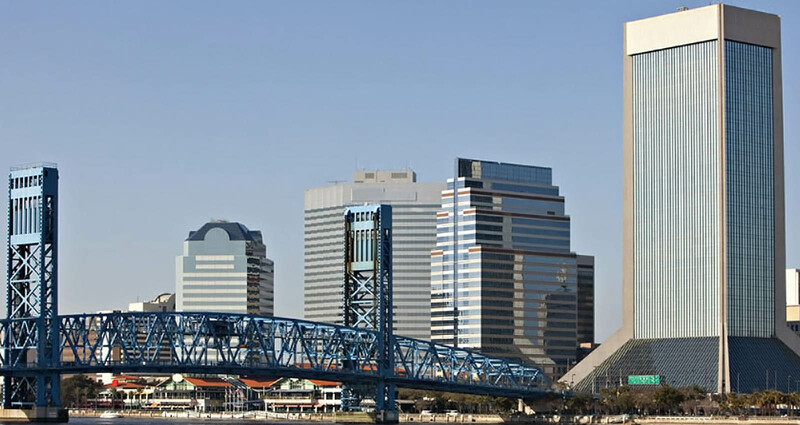 Jacksonville is the principal city in the Jacksonville metropolitan area, with a population of 1,345,596 in 2010. Jacksonville is in the First Coast region of northeast Florida and is centered on the banks of the St. Johns River, about 25 miles (40 km) south of the Georgia state line and about 340 miles (550 km) north of Miami. The Jacksonville Beaches communities are along the adjacent Atlantic coast. The area was originally inhabited by the Timucua people, and in 1564 was the site of the French colony of Fort Caroline, one of the earliest European settlements in what is now the continental United States. Under British rule, settlement grew at the narrow point in the river where cattle crossed, known as Wacca Pilatka to the Seminole and Cowford to the British. A platted town was established there in 1822, a year after the United States gained Florida from Spain; it was named after Andrew Jackson, the first military governor of the Florida Territory and seventh President of the United States. Harbor improvements since the late 19th century have made Jacksonville a major military and civilian deep-water port. Its riverine location facilitates two U.S. Navy bases and the Port of Jacksonville, Florida’s third largest seaport. Significant factors in the local economy include services such as banking, insurance, healthcare and logistics. As with much of Florida, tourism is also important to the Jacksonville area, particularly tourism related to golf. In 2010, Jacksonville was listed as a “high sufficiency” world city in the World Cities Study Group’s inventory, ranking alongside cities such as Liverpool and Las Vegas. People from Jacksonville are known as “Jacksonvillians” or “Jaxons”. The value of your largest asset should never be a mystery. Get your estimated home value in 30 seconds.